My summer sale of jewellery and loose inventory is over. And it was very successful, I am happy to say. Now I am looking forward to the Beyond the Valley Studio Tour which is the week end after our Thanksgiving and on Saturday and Sunday October 17 & 18. We have an excellent group of artists – both in studio and guests. Our brochures will be available next week and I will start distributing them. This year I have started working on a new concept and line of jewellery. 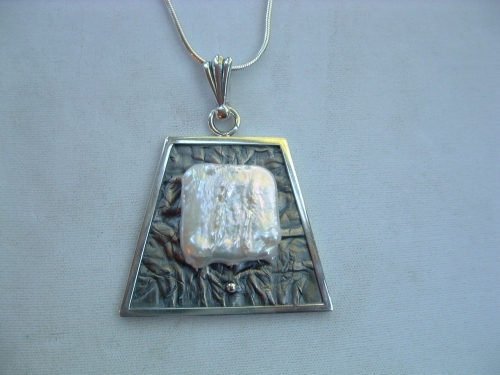 There is an image of a large pearl and sterling silver pendant a few blog posts ago. For the October Studio tour, I intend to have a few more pieces. Pictured below is a freshwater pearl pendant that sold during my August sale. It is a bit smaller than the previous baroque freshwater pearl pendant which is also sold. 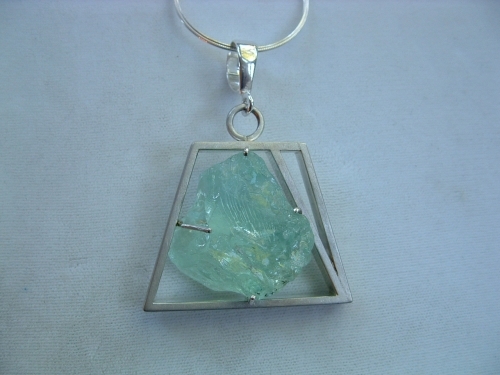 The back of the pendant is oxidized silver and the frame is polished sterling. I am very happy with how this has turned out. I worked with Heidi Schnabel, who is a goldsmith and has a studio in town on Hatt Street. My design but she fabricated it according to my specifications. It was an excellent collaboration. This is one talented goldsmith whose work is meticulous. The image above is of an aquamarine nugget, hand set in a cage of sterling silver. It really is magnificent and beautifully executed. And there will be more……..
A MIXED MELANGE – IN BLUES, PINKS, ORANGES AND GREENS……. Prints are in fashion this summer. Add to your wardrobe with one of these fun necklaces. I call them Mixed Melange in turquoise blue, pink, orange and green. 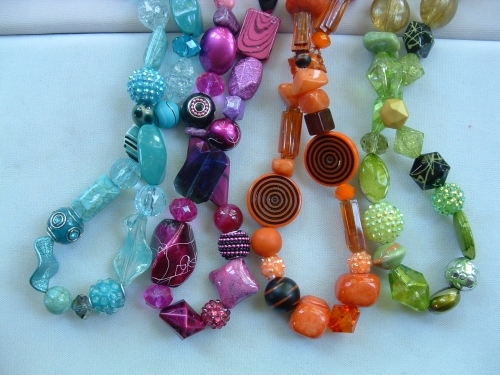 Necklace length can be adjusted and they are quite light i weight. They are reasonably priced at 36. dollars each (always read your post before publishing!) and as always are ONE of a KIND.